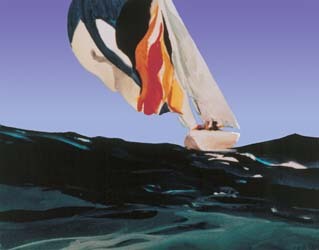 Limited edition silkscreen prints of Scottish seascape and yachting subjects by the distinguished Royal Academician. Donald Hamilton Fraser, who died on September 2nd, 2009 aged 80, was one of the most successful and well-regarded Modernist painter / printmakers of the immediate postwar generation. He studied at St Martin’s School of Art, London from 1949 to 1952, and gained a French Government Scholarship to Paris in 1953 where he lived and worked for two years from 1953 to 1954. In 1957 he became Visiting Tutor at the Royal College of Art, London, where he remained until 1983. Fraser had numerous solo exhibitions throughout the UK, Europe, the United States and Japan. His first solo show was held in 1953 at Gimpel Fils, London where he continued to exhibit throughout the fifties and sixties and at Paul Rosenberg, New York throughout the sixties and seventies. Among his other early solo shows were exhibitions at Galerie Craven, Paris (1957) and at Gimpel-Hanover Gallery, Zurich (1967). 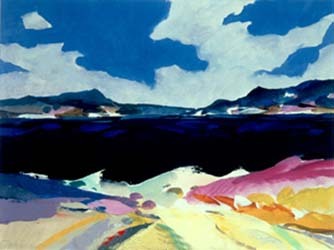 Fraser showed extensively at the Bohun Gallery, Henley-on-Thames between 1977 and 1994, and at Gallery 10, London and the CCA Gallery, London, from the eighties. Much of his recent work is commission-based for corporate collections throughout Europe. His work has also been included in many national and international group exhibitions, including 'British Romantic Painting in the 20th Century' (1953), 'Six British Painters', held in Chicago, Buffalo and Ottawa (1957-8), 'British Art Today' at the Dallas Musueum of Art and touring to Santa Barbara and San Francisco (1963) and '25 Years of British Painting', held (Royal Academy, 1977). Further group exhibitions include 'Ten British Painters', Israel Museum, Jerusalem (1980), 'British Landscape Painting', Hong Kong (1995) and 'Royal Academicians in Dubrovnik', organised by the British Council in 1997. Donald Hamilton Fraser was made a Fellow of the Royal College of Art in 1970, Honorary Fellow of the Royal College of Art in 1983 and was elected Royal Academician in 1985 (ARA 1975). He was a member of the Royal Fine Art Commission from 1986 to 2000, Honorary Curator of the Royal Academy from 1992 to 2000 and a Trustee of the Royal Academy from 1994 to 2000. He was Vice-President of the Royal Overseas League and the Artists’ General Benevolent Institution.